Lavender has been used for thousands of years and today has to be the most loved and used essential oil, and probably the one with the widest and most impressive list of applications. If you can only afford one essential oil then chose Lavender. It is safe, versatile and gentle and may be used undiluted over small areas. The Essential oil with its “balancing” qualities is steam-distilled from flowering tops. I prefer to use the Lavender Officianalis or Angustifoila in my products. It comes from the Mont Blanc region in the south of France. 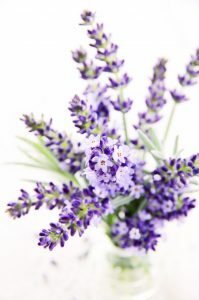 This Lavender is unique in its full bodied and earthy aroma, appreciated by true lovers of Lavender and is also cultivated for the perfume industry. Avoid using lavender essential oil during the first 4 Months of pregnancy – longer if there is a history of miscarriage.